As defined by Dell, “Virtualization allows you to run multiple applications and operating systems independently on a single server. Additionally, administrators can quickly move workloads from one virtual workspace to another – easily prioritizing business needs while maximizing server resources”. Virtualization allows you to both 1) Save on resources and 2) Quickly re-allocate resources. One example of virtualization would be using an operating system for running several other operating systems at the same time. To achieve this, one would create different sandboxes using the primary operating system to facilitate installing and using different operating systems, each one using its own sandbox so that there are no conflicts. The primary hardware would be same and there would not be any need to increase the infrastructure. All the operating systems and the applications running on these operating systems would access the same hardware components without crashing. The following image from techtarget further defines the term. It shows x86 virtualization where a computer or server is modified using a code to create two virtual machines so that each can run its own operating system. The image makes it clear that virtualization allows you to save on resources and infrastructure. 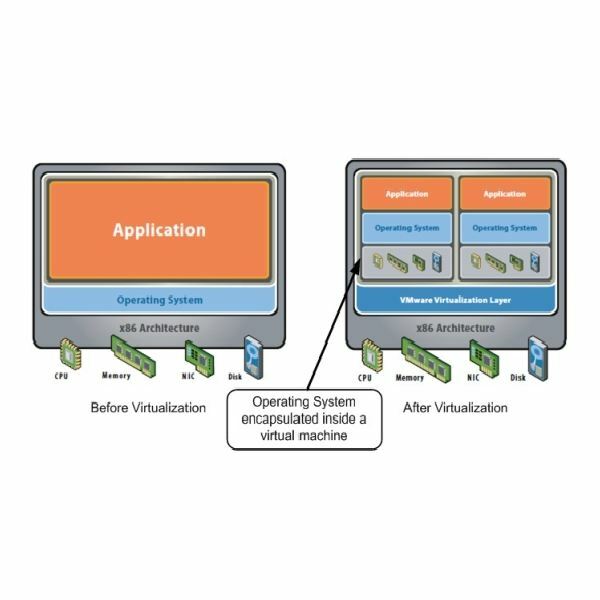 As you can see, the same server hosts two operating systems after virtualization, which if implemented in traditional environment or without virtualization, would need two different servers. Virtualization can also be a pool of resources across a network. For example, you can combine the Hard Disks on a network to quickly and randomly store data. As the need increases, you can quickly re-provision the combined hard disk space to re-allocate a larger storage. In case the storage needs to be decreased, one can re-provision the combined space to re-allocate a smaller storage space. As the process is automated, the time taken to re-allocate resources is nominal and hence you save on time, cost, and maintenance of the infrastructure. 1 Savings on Infrastructure – You need not employ extra infrastructure if you wish to add software/hardware/applications to your network. Virtualization allows you to use the same infrastructure for different purposes. As explained above, you can create virtual environments that suit your needs. 2 Savings on Personnel – In a traditional environment, expansion or implementing a new project would mean hiring more personnel. As you are using the same infrastructure, you can use the same personnel for creation and maintenance of the virtual environments. If you are using a third-party service provider for virtualization, you need not bother about maintenance either – thereby focusing on the quality of projects. 3 Saving the Environment – As you would be using pooled resources, you will not increase the infrastructure. You may even cut down on the existing infrastructure in case you come up with a virtualization plan that lets you do so. This will reduce the consumption of electricity for running the computers and cooling devices – saving on the emissions that harm the environment. 4 Saving Time – As the system of virtualization is automated, it quickly re-provisions the resources to suit your needs. You need not wait for engineers to come and fix things for you. This saves a lot of time.